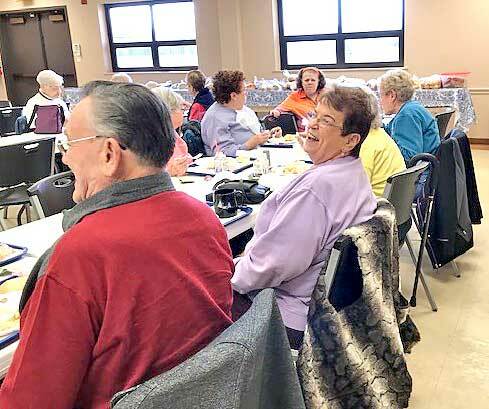 Congregate meals at Falls Township Senior Center - Times Publishing Newspapers, Inc.
Often seniors feel that cooking a big, healthy meal just for one is too difficult and pointless, so they turn to pre-packaged or frozen foods. Or worse, they skip meals altogether. The Bucks County Area Agency on Aging provides funding to the Falls Township Senior Center (FTSC). One of the reasons the center is funded is to provide a meal for those in need of a healthy meal. This is done in one of two ways, either by providing a Home Delivered Meal or by providing a noontime meal here at the center for a small donation ($2 is suggested). A study done in Denmark revealed that one in five seniors report they feel loneliest when eating by themselves. Their friends or family live too far away to join them for meals. When mealtimes are shared with others, they will last as much as twice as long as when a senior eats alone. Our nutritionally balanced menus are developed by the Registered Dietician, along with the Executive Chef at Metz Culinary Management Corporation, where our meals are prepared. The menu changes every four weeks on a quarterly schedule. We ask that you come into the center and pre-register for lunch the week prior so we can assure we have plenty! While the taste and nutritional value of the food itself is important, seniors report that sharing stimulating conversation during the meal is almost equally as important. New friendships are made, and conversation abounds at our tables. Come and join us, have a good meal and make some new friends. Home Delivered Meals can be provided if the senior is not able to get into the center by calling the Bucks County Area Agency on Aging at 267-880-5700 and requesting Meals on Wheels information. While you’re visiting the Center for lunch take a look at our calendar and see all the activities, programs, craft and exercise classes and special events that are available for our members and the community. We also have lots of fun trips scheduled for 2019. We look forward to seeing you at the Falls Township Senior Center.